Kampala — Uganda has sent $200,000 (Shs740m) as financial assistance for the storm victims in Mozambique. President Museveni appointed a delegation comprising Gen Ivan Koreta and Uganda's ambassador to Tanzania, Mr Richard Kabonero, to deliver the assistance this week. "His Excellency [President Museveni] has directed the Ministry of Defence, Gen Koreta and myself to travel to Mozambique and deliver Uganda's assistance following a Cabinet meeting. We hope to travel this week," Ambassador Kabonero said. Gen Koreta represents the Uganda People's Defence Forces in Parliament. The State Minister of Foreign Affairs, Mr Okello Oryem, said the financial aid signifies good will and promised more support if resources become available. "We, as government of Uganda, recognise that President Museveni trained in Mozambique in the 1970s. 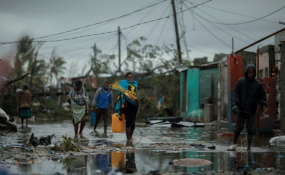 ... We are sending $200,000 to Mozambique. This is just a gesture of good will. When we get more funds in the future, we shall send more aid to our brothers and sisters in Mozambique," Mr Oryem said yesterday. Last week, Cabinet took a decision that Uganda government should send personnel and financial help to Mozambique.